We invite everyone to come out to our meetings and get to know everyone. We have guest speakers like Maricopa County Attorney Bill Montgomery and others. Mr. Montgomery introduced the Bureau Chief for Community Based Prosecution, Treena Kay. Treena gave some overview of the size of the county and how the County Attorney’s office has been reorganized to cover geographic regions. Mr. Montgomery gave a description of the submittal process and provided statistics on how criminal justice in Arizona is doing. Arizona is a treatment first state. Voters approved mandatory treatment for the first two possession or use offenses. So with the turning of the year I thought it a good time to make sure you, the residents we serve, understand that as Phoenix Police Officers it does not matter to us what race you are, what religion you belong to, what socio-economic situation you are in, what your sexual orientation is or what any of the myriad things that make you unique are. At the request of several community members, the Phoenix Police Department is exploring the option of approving a new Block Watch sign. The current signs are made of steel, are non-reflective, and have durability issues in the Arizona climate. The Department recognizes the significance of this endeavor and would appreciate honest feedback from the community. Please take a few minutes to complete this short survey by copying and pasting the below link into your web browser, or by simply clicking on it. In grateful appreciation of your many years of invaluable service and undying support to the Phoenix Police Department and for your contribution to enhance the quality of life in the City of Phoenix. Your civic spirit, sacrifice, and volunteerism are hallmarks of your selfless service. The Phoenix Police Department continues to aggressively investigate the series of unsolved homicides that have occurred in west Phoenix. Part of the investigation included reviewing all incidents that may be related since January 1, 2016. Investigators have completed that review and identified four additional incidents believed to be related to the same serial street shooter/s. In this edition of On the Issues, Councilman Jim Waring interviews Phoenix Police Chief Joseph Yahner. Come out and enjoy the 2nd annual G.A.I.N. kick-off event at MetroCenter on Saturday, October 4, 2014 from 10am - 1pm (inside near Macy's). 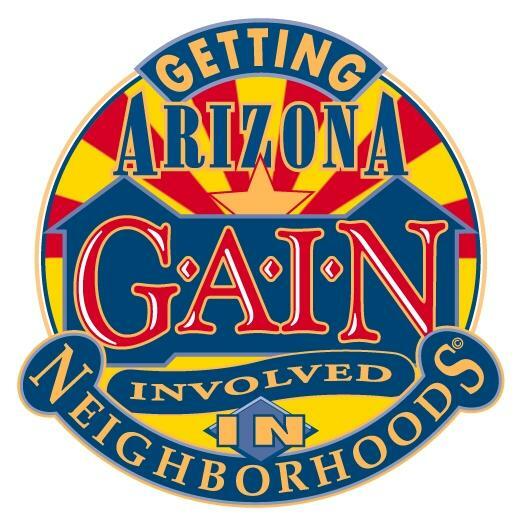 Phoenix Police Department along with MetroCenter Mall has created this event to offer neighborhood groups, block watches, and members of the public opportunities to learn about prorams and resources available to them. If you are curious about what was discussed at the May 2012 Phoenix Block Watch Advisory Board General Meeting we've posted the minutes here. If you are curious about what was discussed at the April 2012 Phoenix Block Watch Advisory Board General Meeting we've posted the minutes here. PFC Joshua Bullis was critically wounded on Sunday the 19th of September while conducting combat operations in Afghanistan. Joshua was struck by an improvised explosive device and has lost both legs above his knees as well as his left arm above the elbow. In addition to the every ten year census population count, the U.S. Census Bureau conducts ongoing surveys that assess the demographics, economics and welfare of communities. We collect data for important economic indicators like the unemployment rates and housing starts each month. At this meeting we had a guest speaker from the Fire Department, Neighborhood Services Department, and had information on Landlord / Tenant Rights, Improving Communication with Fire and Police, Crisis Financial Management, the most common Blight found in neighborhoods. Thank you for coming to the August 2010 Maricopa County Home & Garden Show! What a great Show! Enjoy the photos! It shows some of the programs of the Police Department and a table was set up for Phoenix Block Watch Advisory Board to help revitalize Block Watches throughout Phoenix. We enjoyed visiting with everyone. Here is a summary of the March 23rd Phoenix Block Watch Advisory Board General Meeting hosted by Desert Horizon Precinct at the Moon Valley Country Club. Desert Horizon Precinct Commander, Sandra Renteria, thanked the people in attendance and also the community for their support and being the “eyes and ears” for the police department. She informed everyone in attendance that Desert Horizon Precinct had 325 active Block Watch groups and 100 active PNP members. She also stated that the crime stats for 2009 decreased 16.6% for violent crimes,20.6% for property crimes and encouraged people to continue to call police regarding suspicious activity. The Commander discussed the two new Precincts that will be added to Desert Horizon and how they will benefit the community. Jan 26, 2010 Phoenix Block Watch Advisory Board General Meeting was hosted by the Cactus Park Precinct at The Manzanita Senior Center.